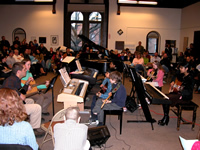 The Music Learning Center offers a wide range of musical groups for students to perform in. Each group is formed by carefully matching students who are close to one another in age and skill level. Each of these programs is designed to supplement the student’s weekly lesson. Bands & Ensembles rehearse for 6 consecutive weeks and then perform at a MLC recital. An MLC instructor who is trained in the type of music the students will learn leads these fun and highly enriching programs. 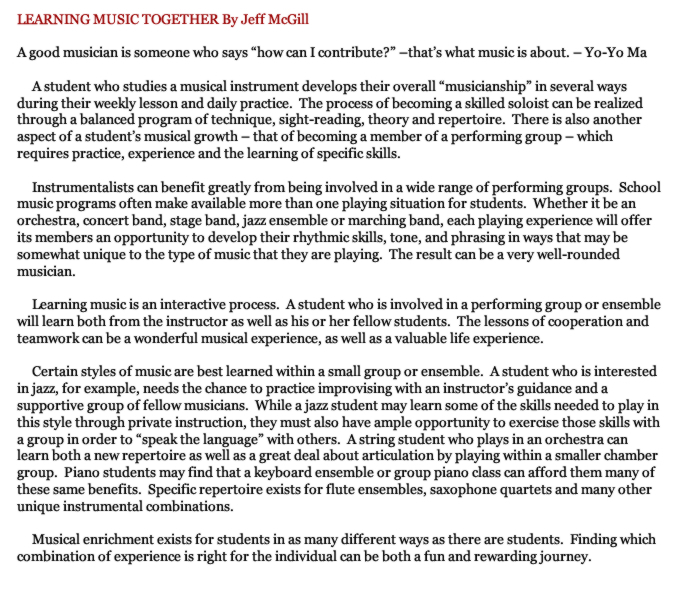 Hear what our Director, Jeff McGill has to say about the many benefits that are enjoyed by students who participate in performing groups. The MLC Rock Bands specialize in the performance of popular rock music under the direction of our trained and experienced band coaches. The ensembles are open to players of all instruments and vocalists. Participants will be grouped according to age and skill level and will perform music from Green Day, to Deep Purple, to the Beatles….as long as it rocks! MLC Rock Bands will also be given an opportunity to make a CD recording of their performances. Rock Band members do not need to be enrolled at MLC, so invite your friends! The Music Learning Center offers several different types of Guitar Ensembles for students to choose from. The Youth Guitar Group specializes in the performance of popular American music. This ensemble is for the beginner guitarist and requires the ability to read natural notes in first position on the first 3 strings and the rhythmic skill to accurately play quarter, half and whole notes and rests. Songs such as “All Together Now” from the Beatles, or “Summer of ‘59” will be played. A Six string acoustic or electric guitar is needed. Participating in this group offers students a great incentive toward practicing and continuing to develop on their instrument. The Intermediate Guitar Ensemble focuses on traditional pieces while challenging the player to increase their knowledge and skill of guitar ensemble playing. Students should have the ability to read all notes in the 1st position, accurately execute eighth, quarter, half and whole notes and rests, read in 4/4 or 3/4 meter and have an understanding of ties, pick-ups and repeat signs. A six string acoustic or electric is needed. The Blues & Jazz Guitar Group specializes in those musical styles and will develop skills in group performance, soloing, improvisation and accompaniment. Participation is open to guitarists aged 12 and older who are able to read notation in open position and have knowledge of open chords. Pieces such as Freddie Freeloader (Miles Davis) and Heaven (Los Lonely Boys) will be performed. Participation is open to guitarists, bassists and drummers. Until recently there have been very few opportunities for piano or keyboard students to find group playing opportunities. Advances in music technology now make that not only possible, but a lot of fun! Each Keyboard Band will feature up to six piano students performing special arrangements and using a wide range of keyboard instrument sounds. 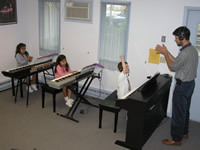 The MLC’s Group Piano Classroom serves as home to the Keyboard Band program. 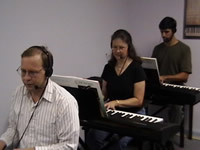 Using “state of the art” digital pianos, headsets, and a unique control console that allows students to be paired in any combination, the lab system allows for both individual attention and group playing. The digital pianos feature a weighted piano-like feel to the keys and touch sensitivity that faithfully duplicates the tone of a piano. They also allow for the student to select from hundreds of additional instrument sounds. One student in the group may be using a guitar sound, while another student may be sounding like a saxophone, and so on. The end result is that the group can sound like a rock band, a jazz combo, or a full orchestra! The Music for keyboard bands is carefully selected to match the abilities of the students who make up each individual “Band”. Pieces will draw from a wide range of musical styles including Pop, Classical, Jazz, Contemporary and Rock. Additional benefits include: improved sight reading, introduction to arranging concepts, development of skills in teamwork and added confidence in performance. Students love playing in a Keyboard Band! Requirements: The student should be able to play Level 1 and above in most piano books, have 1 or more years of piano lessons, and a basic knowledge of Bass and Treble clef notes in C Position. Many musical styles will be performed ranging from classical to popular, and jazz to rock! The MLC Jazz Combo specializes in the exciting world of jazz music. Students will learn what it takes to play in a small group with other instruments such as drum set, guitar, keyboards, percussion, brass and woodwinds. Topics covered will include soloing, improvising and providing accompaniment. Participation is open to instrumentalists interested in Jazz aged 12 and older. Participants should know basic chords (guitarists & pianists) and be able to play at an intermediate to advanced level (check with our office if you aren’t sure of your level). The music performed will include pieces by some of the greatest jazz composers of all time including Duke Ellington, John Coltrane and Miles Davis. 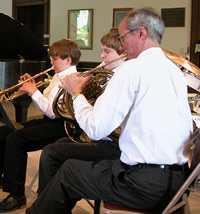 The Band Ensemble will learn a variety of classical and popular songs while developing skills in small group performance. The music is carefully selected to match the level and experience of the students participating. Pieces that have been performed by past MLC Band Ensembles has included a Chorale by J.S. Bach and a medley of well-known Symphonies by Tchaikovsky and Beethoven and the theme music to the motion picture “Star Wars”. Players should be able to play a one to one and half octave range, perform eighth notes and have at least 1 year of experience playing in a band or orchestra. The MLC Flute Choir will learn a variety of classical songs while developing skills in chamber group performance. This is a great opportunity to play in a small ensemble and offers students an opportunity to improve their intonation and musicianship. Some of the beautifully arranged pieces that will be played come from famous composers such as Telemann, Copeland and Pachelbel. Knowledge of scales up to 3 flats and the ability to tune your flute is required. Stop by the MLC office if you would like more information about the skills needed to be able to participate. Flute Choir members do not need to be enrolled at MLC, so invite your friends! DON’T MISS THE CHANCE TO PARTCIPATE IN ONE OF THESE FUN AND REWARDING GROUPS. THERE’S NOTHING LIKE BEING IN A BAND!